Custom emoji in Slack are small picture files that you upload to your workspace. It’s best to use simple icon-like images that look good at a small size — any image that you can reduce down to 128 pixels by 128 pixels will work. And it’s quite alright if you’re not a designer used to creating or cropping images. Sites like Mojician and The Noun Project offer custom emoji readily available to download and add to your own workspace. Here are some ideas for emoji that you can make and upload, whether to move projects along or to add a dollop of delight to everyday conversations. Among the most popular kinds of custom emoji that people upload to their Slack workspace are little heads of their coworkers and bosses. Many teams use them when reacting to messages in Slack as a way of “tagging” themselves or others. Say someone posts a new idea to a channel: You can add your own emoji face to volunteer to work on the idea. On the flip side, if someone is looking for a person with a specific skill set to help on a project, you can recommend someone by adding their emoji face as a reaction to that message (and be sure to drop them a Direct Message to let them know, in case they missed it). We’ve heard from other teams that creating emoji versions of coworkers helps them feel included. People have also told us that they use custom emoji to mark their “vote” on ideas posted to a channel and to celebrate big wins, too. And some teams just prefer to put their own spin on things and use their custom emoji to illustrate highly specific reactions. Custom emoji plus setting a custom status makes for a really powerful combo in Slack. A custom status lets everyone know your coworker Carmen is in the NYC office today. When your company is distributed across multiple locations, uploading numbers as custom emoji (to show, say, which floor of a building you work on) or flags and airport codes (like YVR or SFO) to denote geographic office locations helps people discern not only where you are but which time zone you’re in — so they’ll know when to expect a response. For teams that visit customers often, uploading clients’ logos as emoji means sales staff can indicate when they’re off-site at the Acme Corporation. Company logo emoji can also be useful for people who work at agencies and need to show which accounts they’re currently working on. Slack’s Reacji Channeler is a useful tool that automatically reposts messages to a specific channel of your choosing. You can use it to do all sorts of things, like keeping track of important announcements in a company-wide #news channel or sending bug reports and new feature ideas to specific teams within your organization. Or sometimes, as in the following case, you can use the Reacji Channeler to track the funniest things people say across your entire workspace. 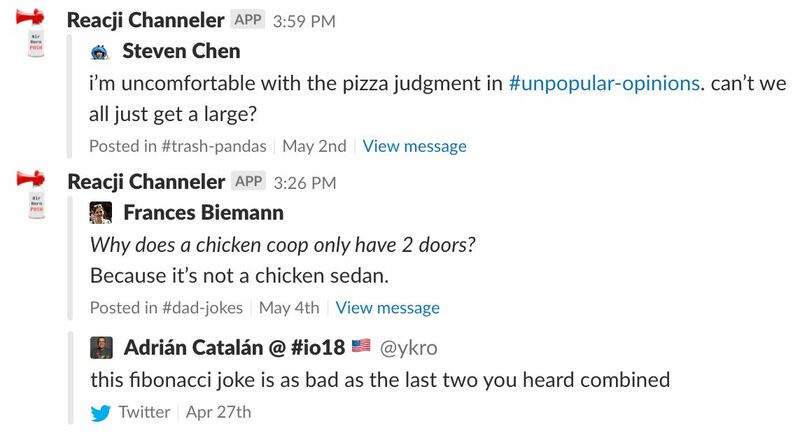 While the Reacji Channeler works with any emoji in Slack, in order to prevent false positives — pulling irrelevant information into your channel because someone used that emoji for a different reason — you’ll want to use a custom emoji for it or pick an obscure one that’s used infrequently. To make your work life just a little easier, we offer a set of downloadable custom emoji that do things like help you track company news, mark major decisions, collect epic jokes, and repost announcements about free food. Groups of people working closely together will eventually come up with their own shared culture of silly in-jokes and callbacks to things that have happened, and that often manifests in custom emoji. Someone then thought to add the hand from the thinking emoji to other pictures and gave them a whole new meaning. If this tickles your fancy, there’s an online tool that lets you add thinking hands to any uploaded image. Another popular emoji in our workspace is 🎉 (:tada:) which we use liberally to celebrate achievements. But when we needed something for when things went sour, we made one without any confetti or streamers and called it :tadont:. Here’s a good example of it in action. If you already have custom emoji on your team and you’d like to punch them up a bit, Total emojis as a service! offers a one-stop shop with more than 20 options for turning any small image into something that moves, spins, shakes, or has various images overlaid on top. Try a few out and see what interesting new versions you come up with. Emoji make up an ever-growing picture language that helps people convey meaning to one another in text-based communication. 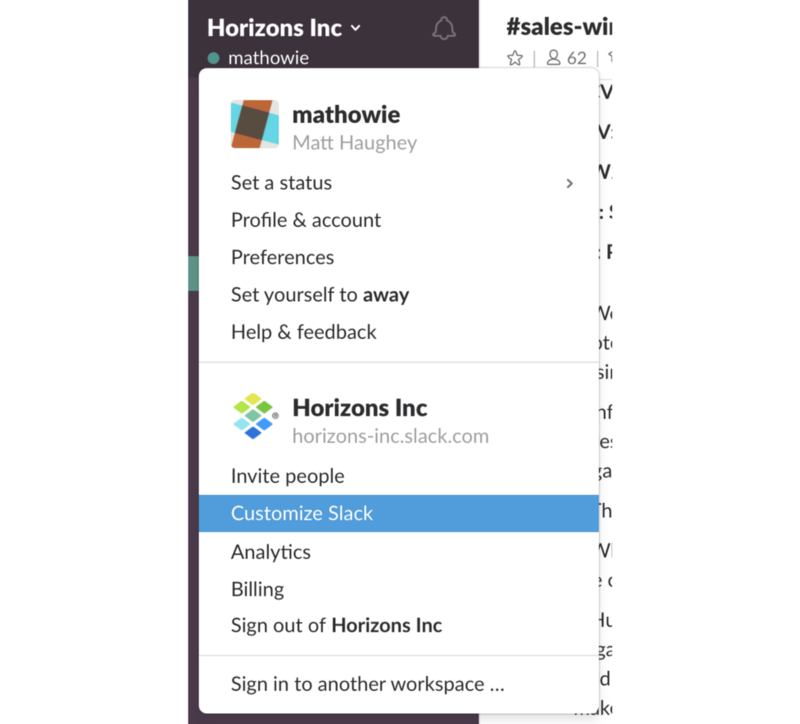 They’re both fun and useful, and we’re always finding new ways to use them in Slack to help streamline our work. Give it a go. Hit the Customize Slack option in your workplace settings to start adding custom emoji to your team. They can be small artifacts that have a big impact on your team’s culture while simultaneously moving your work forward.